++We had come to the Lienad system to deal with an incursion of the vile Eldar of the Craftworld Iyanden, but found ourselves instead fighting side by side with them against a massive tyranid infestation. In true deathwing honour, only one squad of Terminators was assigned to assist, while the rest of the Deathwing remained aboard ship for observation purposes. At the site of one of the bloodiest battles, the squad of Terminators suffered several casualties holding a strong point against nearly twenty thousand tyranid constructs. For several days we held the ridge against all invaders, assault cannon and storm bolters never ceasing in fire, till the bodies of the Tyranids were piled twenty deep below the ridge. As the Tyranids gathered for a final, crushing assault, I, among the six last terminators, prepared to face the alien scum for the last time. We readied our power fists and drew the ceremonial swords from out belt, leaving the now empty bolters behind, and stood firm to meet the inevitable charge. As the Tyranids scaled the ridge on the bodies of their fallen comrades, a ghostly mist shrouded the entire hill. The sudden silence that enveloped the battleground was totally chilling. And from that shroud, who should burst forth but the Lion himself! He strode like an Angel of Death, twin swords flashing. The Tyranids, oblivious to the danger before them, swarmed towards this new target. He was upon them in one sweep of his mighty, steel-clad wings, and broke the wave of Genestealers tearing towards him with a hail of steel. In a second he was upon them and in a supernatural blur of flashing swords he tore through the Tyranid ranks like a whirlwind. Severed heads, purple ichor and dead bodies were thrown in all directions. I swear that day I saw three Carnifexes, those accursed alien beings who can shrug off several direct lascannon hits, cut in half with a single sweep of his green robed hand. He proceeded to eviscerate the entire Tyranid horde. Finally he came face to face with the four Hive Tyrants who had been coordinating the activities of the entire Tyranid campaign on this planet. From afar I watched, enthralled, as he faced off against the tetrad alone, surrounded by the slain Tyranid warriors who formed their elite bodyguard. Each towered over him by a head, but he faced them coldly and calmly. With a twitch, he cut one to ribbons in a rain of feathers. Spinning to parry a blow from the second, he carried it through and sliced through the entire Tyrant, bonesword, chitnous armour and all. The two Tyrants sought to entrap him in a pincer move, but with a single movement, he spread his wings to their full extent, swept them towards each other and disemboweled them both on a single sword. Picking up the four heads in one skeletal fist, he lifted off gracefully and settled down in front of us. My whole squad fell on their knees, filled with reverence for the Great Primarch. He commanded with a single word, "rise." We gazed up into the void of his hood, as he set the four heads on the ground as trophies. With that final duty done, he disappeared as abruptly as he came into the mist. On the foreheads of the grinning skulls, a single emblem was carved with intricate precision, precision that even our most skilled techmarines could not replicate. The symbol of the Broken Sword. The sign of the Deathwing. Legend of Legends: he Angel of Death only appears in times of dire need or great calamity. Therefore it may only appear once the Dark Angels have sustained over 25% casualties(Counting troops, bikes & speeders only; Independant characters, vehicles and dreadnoughts do not count) It always starts in reserve and must always deep strike. Ethereal Being: The Angel of Death hovers on the interface of reality, constantly transversing the rift between the material world and the immaterium. Therefore, it can only ever be wounded on a 4+. While in the material world its steel like wings provide a 2+ save against ranged attacks. The aura created by its presence makes it very difficult to destroy and thus is treated as invulnerable with a 5I+ save. Range 12" Str 3 Ap 4 Assault 4. On charging he gains one special attack that can be used against the first model that comes into base to base contact with him. It has a strength equal to the distance charged up to a maximum of 10 and hits on a 2+. Who can say what the Angel of Death is, or where it comes from? Only one thing the Imperium knows for sure, that this sinister being leaves only a path of death and destruction in its wake for the enemies of the Dark Angels. It comes and goes at will, appearing without any pattern, its presence being noted in small skirmishes to epic battles. The one omnipresent feature associated with its appearance is the presence Legionnaires Astartes of one particular chapter, the first and most sinister chapter, the Dark Angels. It appears on the battlefield, a towering robed figure, hood obscuring its head, skeletal hands gripping the twin swords that he wields, the Sword of Vengeance and the Sword of Redemption. 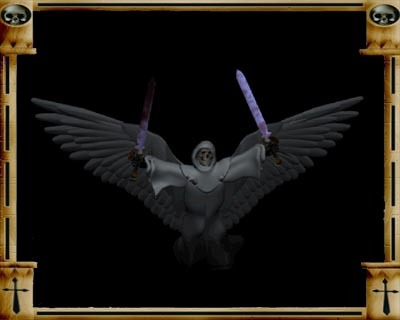 Visages of this cloaked figure adorn the banners and armour of the Dark Angels. To them, he is their saviour, their Avatar; The Dark Angel; The Lion. Independant Character: The Angel of Death follows all the rules for independant character but always fights alone and may never join a squad. Monstrous Creature: The Angel of Death towers over its foes and makes a mockery of any armour or vehicle plating. In close combat the Angel of Death ignores armour saves and rolls 2d6 for armour Penetration. Fearless: The Angel of Death has nothing to fear, and passes instantly any and all morale or leadership checks it has to take. Fearsome Creature: Any enemy wishing to assault this creature must pass a leadership test. Winged Creature: He can assault 12" ignoring any intervening terrain, and rolls 3d6 for pursuit. The Angel of Death is armed ith a pair of power swords, the Sword of Vengeance and the Sword of Redemption. It also has wings which are used as deadly weapons as described below. The two weapons and the wings have been considered and included in the profile above. This character is one of the few in this Codex that I have termed Super-Special characters. Commonly knonw in gaming parlance as "Ubber-Characters" they tend to shift play balance to some degree. Although the super-special charcetrs in the Book of the Unforgiven are nothing compared to some of the super-characters seen especially in Warhammer Fantasy Battles, they should nonetheless used in the spirit of the game. Obviously, permission from your opponent needs to be sought before utilizing such characters. An extremely rare imagery of the Dark Angel of Death, kept under constant vigilance and guard in secret in the highest towers of the Tower of Angels. "The Dark Angel of Death"
Is this spectral creature the physical incarnation of the sum consciousness and stubborn will of the Dark Angels? Or Is this spectral being the physical manifestation of the Lion's will returned? Or is it one aspect of the vengeful Emperor, his light shine forever? Or is it in anyway connected to the enigmatic Watchers in the Dark? Suffice to say, only the Emperor on his Golden Throne knows. The inconsistency of it's sightings and the mysterious nature of its origins is the source of much theological debate between the chaplains and librarians of the Dark Angels.